The free glossary could help agents and brokers tap into a growing market of homebuyers. The U.S. has more Spanish speakers than any other nation on earth except Mexico. For the vast majority of Hispanics, also known as Latinos, homeownership remains a central goal of achieving the American Dream. 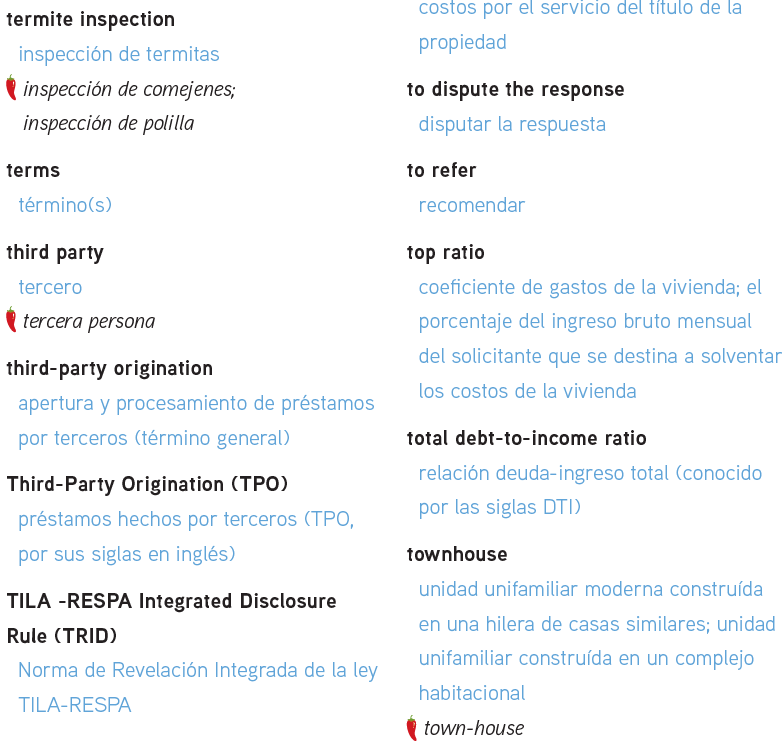 To help real estate agents and brokers tap into a market that is expected to comprise more than half of first-time homebuyers in coming years, the National Association of Hispanic Real Estate Professionals has created a free Spanish-English glossary of real estate industry terms. “A home purchase is widely recognized as the most significant financial transaction most people will make in their lives. For individuals who either prefer to speak Spanish or only speak Spanish, this already complex transaction can become overwhelming,” said NAHREP President Joseph Nery in a statement. The glossary is alphabetically organized — first in English, then in Spanish. Some terms include both a formal translation and a colloquial translation that may be more familiar to consumers. The colloquial translation is denoted by a red chili pepper. In a recent survey, top-producing Latino agents and loan officers indicated that 40 percent of their transactions make use of Spanish at some point, and as much as a quarter of all transactions use Spanish exclusively as the means of communication, NAHREP said. “In an already complex and increasingly regulated environment, NAHREP saw the need to provide guidance and consistency on Spanish-neutral translations of the words and phrases used most frequently over the course of a real estate transaction,” said NAHREP co-founder and CEO Gary Acosta in the glossary’s preface. NAHREP created the glossary with the help of paid consultants and a volunteer committee of real estate professionals, including real estate brokers and mortgage lenders. They were chosen based on their strong language capabilities, national origin and familiarity with the terminology most frequently used in real estate and mortgage transactions, according to NAHREP.